Our philosophy as a university is to think and do. We take what we learn out of the classroom and get to work in our local community and around the world. We make a real and measurable impact. We change lives. At NC State, it's not just theory. It's practice. Public History graduate students have created Communicating Communities, an exhibit at the City of Raleigh Museum. The exhibit explores the power of memory and technology, and the ways both have been used to forge identities and connections to the many communities that make up North Carolina's capital city. Psychology professor Lori Foster was tapped to serve on the White House Social and Behavioral Sciences Team, a multi-disciplinary group of experts that is helping federal agencies streamline access to their programs and improve how they communicate with constituents. NC State seeks out strategic partners around the globe. That quest took Dean Jeff Braden to Uganda recently, where he led a university delegation to explore the potential for partnerships between Makerere University, the Kingdom of Buganda, The Aids Support Organization (TASO), and the Maamma Watali Project. Initiated in the College of Humanities and Social Sciences in 2002, the Institute for Nonprofits is a community where ideas, resources and support are devoted to strengthening the capacity of nonprofit and social sector organizations in N.C. and beyond through research, education and engagement. We benefit from the expertise of leaders from around campus and in the community. Align mission, methods and resources. Balance individual interest and the common good. Capitalize on opportunities associated with diversity. Move beyond charity to systemic change. We serve all of North Carolina's 100 counties. The Center for Family and Community Engagement is active in each of North Carolina's 100 counties, providing its signature training in family-centered practice. NC State’s Center for Family and Community Engagement (CFFACE) provides a range of public service and research. The center, founded in 2008, fosters partnerships among families, communities and the academic sphere that address and support families through community engagement. We work across the state of North Carolina, offering training and technical assistance, and providing evaluation and research. We work across disciplinary boundaries to conduct research and improve best practices at the local, national and global levels to support the health and well-being of families and communities. The college’s new Social Entrepreneurship Initiative helps students meet global issues head on. For decades, the sole measure of a business’s success was its economic bottom line. Today, more companies and business leaders are looking for results beyond profit margins, and the next generation of students is taking note. This movement, called social entrepreneurship, advocates for business models based on finding innovative solutions to social problems. While the typical entrepreneur is more focused on profits and return on investment, social entrepreneurs take into account the social, cultural and environmental returns to society. 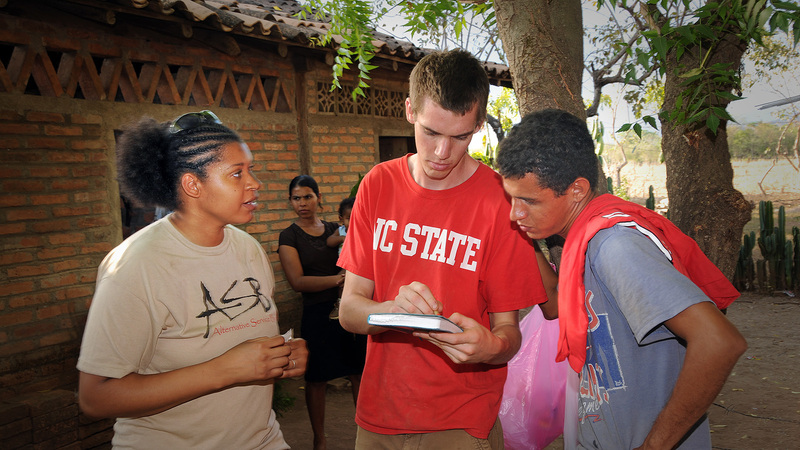 Nourish International, an organization that invites college students around the country to be a part of the solution to global poverty, launched its NC State chapter in fall 2014. Meredith Davis, a sophomore majoring in social work, serves as NC State’s chapter leader. The group will conduct social entrepreneurship business activities on campus and use the profits earned to fund poverty reduction projects in countries around the world. Traditionally, the measure of a business's success is its economic bottom line. But more companies and business leaders are looking for results beyond profit margins, and the next generation of students is taking note. Our Humanities Extension Program directly connects North Carolina's public school classroom teachers with faculty from the college who want to share their knowledge and expertise with students in grades K-12. The program creates new partnerships and builds on existing relationships between the college and public schools across the state. Our aim is to foster an understanding of and appreciation for the humanities and social sciences among students. The program is also a powerful recruitment tool for college-bound young people, exposing high school students to potential areas of study.